Ole Gunnar Solskjaer insists Paul Pogba’s head has not been turned by Real Madrid’s interest. Manchester United is now said to be preparing talks over a new long-term deal with Pogba, as reported by The Standard. Anyone who has watched Pogba in recent weeks will tell you his form has dropped from Solskjaer’s initial few months in charge, but the Norwegian clearly still plans to build his United side around the Frenchman. A lot of people believe Pogba’s form has tailed off because of Real Madrid’s public admiration of him, with Zinedine Zidane openly expressing an interest in working with the player. Pogba, however, didn’t help the situation by fuelling speculation about his future when he admitted it would be a ‘dream’ to play for the Madrid club. “There might be a campaign, there might be press, you never know what there is,” Solskjaer said in his press conference, as quoted by The Independent. “But in my talks with Paul he’s always been positive. I don’t see a difference in him when I chat to him. The World Cup winner is under contract at United until 2021, so United are not in a situation where they must consider offers for the player, and all hints from the club suggest they want to keep their man. That shouldn’t be a surprise given how Solskjaer appears to enjoy working with Pogba, who, definitely respects his current manager more than José Mourinho. It will be interesting to see what Pogba decision makes when the idea of a new long-term deal is put to him. 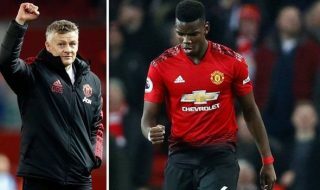 The report goes as far to say Pogba is also in contention to become United’s next club captain, with Solskjaer confirming Antonio Valencia will leave as a free agent in the summer. Stretty News is in the running for Best Club Content Creator at the Football Blogging Awards. You can vote directly here, or follow the simple instructions to vote via social media.